Even from Earth orbit, it's easy to see the devastation. Photos from space show the incredible scale of the devastation caused by the still-raging Southern California wildfires, which have blackened almost 200,000 acres and forced thousands of people from their homes. From his perch aboard the International Space Station 250 miles above the Earth's surface, NASA astronaut Randy Bresnik snapped a series of unsettling photos and posted them on Twitter. "Today's pass over SoCal unfortunately doesn't look any better," he said in a tweet posted on the evening of December 7. 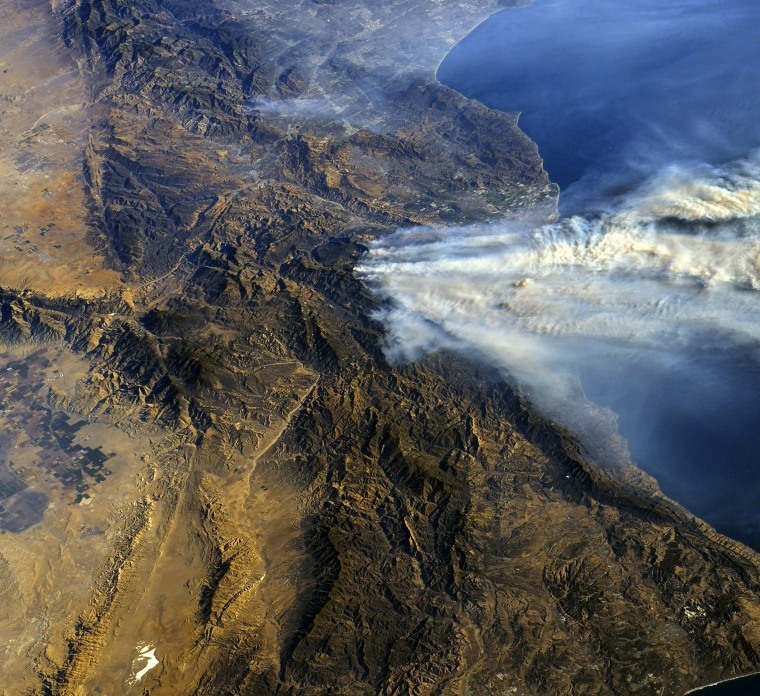 "The fires east of Camp Pendleton and in Baja are visible as well." That glum tweet came on the heels of two earlier tweets about the fires that Bresnik posted the previous day. Earlier, NASA had posted satellite photos of the fires taken on December 5 by its Terra satellite and the European Space Agency's Sentinel-2. The Terra photo shows thick plumes of smoke streaming out over the Pacific Ocean. In the Sentinel-2 photo (below) — which uses false-color imagery to reveal details of the blazes and the damage they've caused — active fires are orange, the burn scar is brown, unburned vegetation is green, and developed areas are gray. The weather in Southern California doesn't seem to be helping firefighters contain the blazes; the National Weather Service warned on its website earlier today that a "red flag warning remains in effect" given the low humidity in the area and the high winds. But maybe the winds will diminish according to Bresnik's tweeted wish: "May the Santa Anas die down soon."